FORT THOMAS MATTERS: Council To Decide The Fate Of Newly Acquired Property on Montvale Ct.
Council To Decide The Fate Of Newly Acquired Property on Montvale Ct.
Councilman Ken Bowman, Mayor Eric Haas, Councilman David Cameron and City Administrative Officer, Ron Dill. FTM file. At the January 3 Fort Thomas City Council meeting, council authorized the city to purchase 17 Montvale Court, a two-family residential house for a purchase price of $126,850. The deal was closed on January 11, 2017. It was out of nowhere and stuffed at the backend of council's first meeting of the year in an executive session. RELATED: Exclusive: City of Fort Thomas Acquires Property On Montvale Ct. The purpose of the acquisition, according to city officials, was to allow the city to explore options involving the property to give access to vehicles and pedestrians as it relates to the city parking lot behind the Hiland building and city-owned, Storr's Field. City Administrative Officer, Ron Dill, said that the ownership of the property allows the city to consider potential consolidation of access points with adjacent properties. That's namely the little city parking that is in the back of 18 N. Fort Thomas Avenue and Storr's Field. "The potential for improved access within the Central Business District is something that we've been looking to do for quite a while," he said. "The opportunity presented itself to us and we had to take action on it quickly." 17 Montvale Ct. FTM file. The Public Utilities Committee, which consists of Councilwoman Lisa Kelly and Councilmen David Cameron and Ken Bowman met to discuss what would be the short and longer term use the city could have for that building. Four options were presented: to raze the structure and maintain the property as a vacant lot until a final plan is developed, to maintain the current structure and vacate occupancy until the city visioning process is complete, to maintain current rent structure until final plan is developed or to allow the current tenants to live in the structure until April 1 and renegotiate the lease on a month-to-month basis. Residents of Montvale Ct. also showed up to hear their plans and express their concern that their quiet cul-de-sac street could eventually become a cut-through. "Although this structure may need to be razed to provide anticipated access, it is also possible to pair the property with adjacent properties to create adequate access, which may only affect a portion of the property. We still need to study this at length and we have time to study the best use for the property," said Dill. Haas had also mentioned that property that could also provide access to the connectivity the city desires, is potentially the U.S. Post Office parking lot, which is adjacent to 17 Montvale. 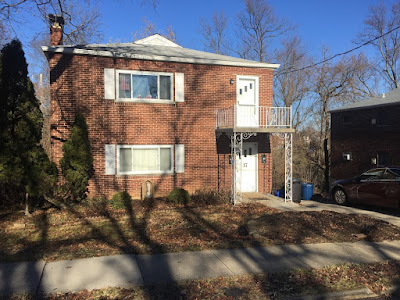 As for the structure itself, there are two, 1000-square foot apartments in 17 Montvale Court and according to inspection reports performed by the city, are both in very good condition. The home was build in 1954. There is a long-term tenant in one of the apartments and another person that has moved in within the last six months. "The home appears to be in sound and very functional condition," said Dill. "There are no items of significance or immediate need of repair or concern." Dill said that the city told the tenants that they would render a decision on what they intended to do with the home by April 1. After the purchase price, closing costs and legal fees, which were taken from the General Fund Reserves, the city ended up spending $128,115.68 on the acquisition. If they were to become landlords for the tenants, they would incur a loss of property tax and other ancillary expenses to the tune of $2,372.54. After discussion among the council members and input from the Montvale residents, the committee decided to allow the tenants to stay in the home and renegotiate their lease agreement. Dill said they would likely have to evaluate what a typical apartment rent would be and increase the rent to the market rate. After doing so, the annual profit would be $4,827.46. He said the city does have experience with this type of acquisition, when it bought 110 N. Fort Thomas Avenue, which is now home to Dave Walkenhorst Insurance Agency. "We did similar purchases when developing plans for the CBD and this process proved very beneficial as these properties were crucial to some of the redevelopment that occurred at that time," he said. The committee's recommendation will now go in front of full council for a vote, which is expected to pass.